Chain Reaction Cycles, Amazon and Amazon UK. You want to quickly and effortlessly pump up your tires? A floor pump is the way to go. A good one, that is. While there are many floor pumps that get the job done, they don’t always do it well. In this article I’m reviewing Topeak’s JoeBlow Sport 2, and I’ll address every concern I faced when deciding which pump to get. Gauge: Analogue, bar and psi, reads up to 160 psi / 11 bar. Capacity: 160 psi / 11 bar. If you have bikes with small wheels (kids bikes, 12 inches), then you might have trouble getting the pump’s large Twinhead between the spokes. 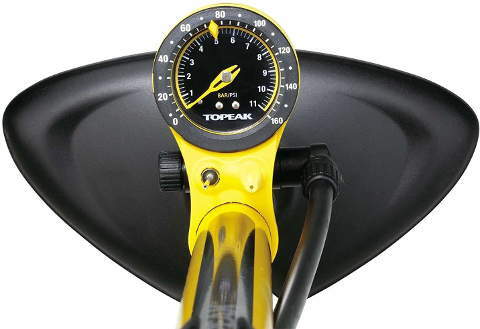 I used my Topeak Turbo Morph frame pump when my son had a 12″ wheel bike. Quality construction: The pump feels solid when I put all my weight on it while pumping. I’ve been using it for more than 2 years to pump tires on 4 bikes, and this pump looks and feels like new. Easily serviceable: Greasing the shaft is very easy, and should be done once a year or so. Be sure to use grease, not chain lube, as the latter is too runny to last. If you ever need replacement parts for your Topeak Joeblow Sport pump, you can order them online or buy them in your favorite local bike shop, and install them yourself. Effortlessly pump tires: If your bike has Presta valves, always loosen the tip, then depress the valve with your finger before installing the twinhead. This applies to all Presta valves, and has nothing to do with how the pump works. The pump is efficient, and you’ll be amazed at how quick it is to inflate tires. Especially if all you had was a mini pump or a low quality floor pump. Is Topeak Joe Blow Sport II the right choice? Don’t unscrew the presta valve all the way. Always release a little air by pressing on the Presta valve with your finger before installing the twinhead. The pump has a check valve near the base. Its job is to prevent air from coming out of the tire into the pump’s barrel when you first install the pump head onto the valve. Otherwise the pump’s handle would shoot upwards every time you connect the pump to the tire. You get a reading on the gauge after you start pumping. That’s by design.